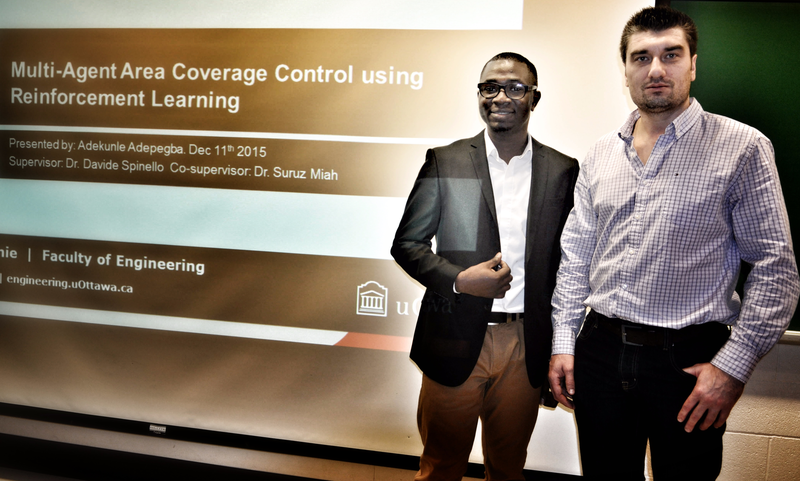 Yesterday, Aliakbar Baldiwala presented his MASc Thesis work, titled “IOT for fleet management”. 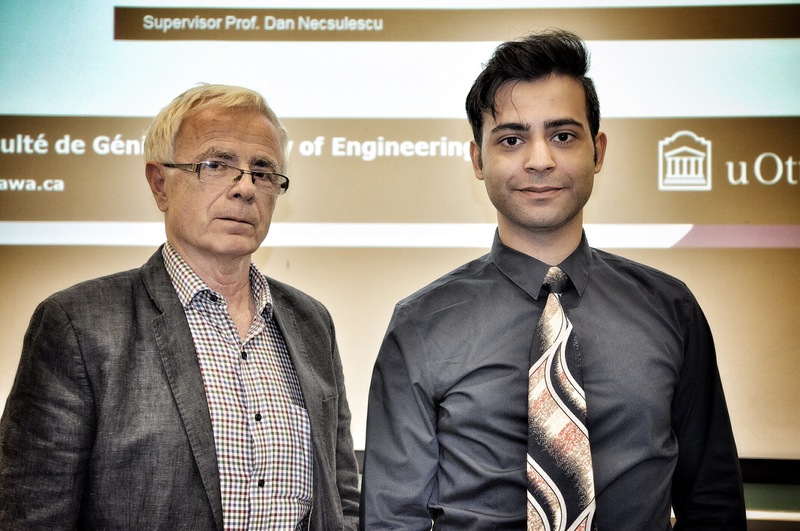 Supervisor Dr. Dan Necsulescu was in attendance. 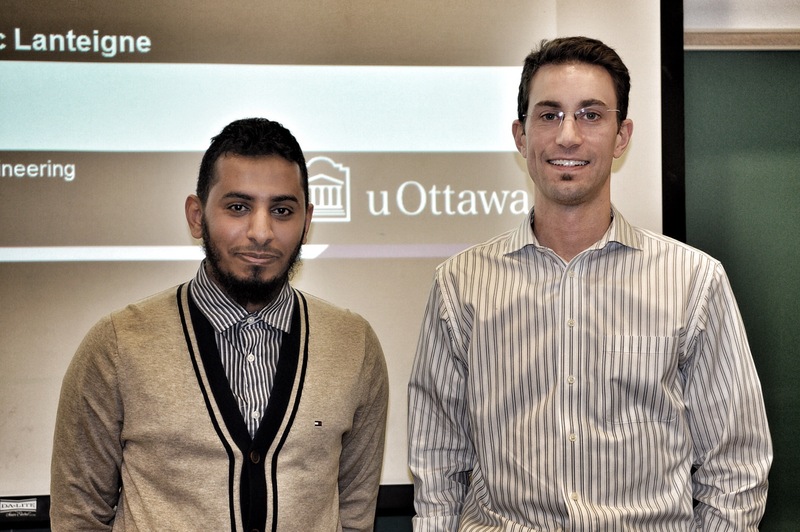 Thank you to Aliakbar and Dr. Necsulescu for an informative seminar! 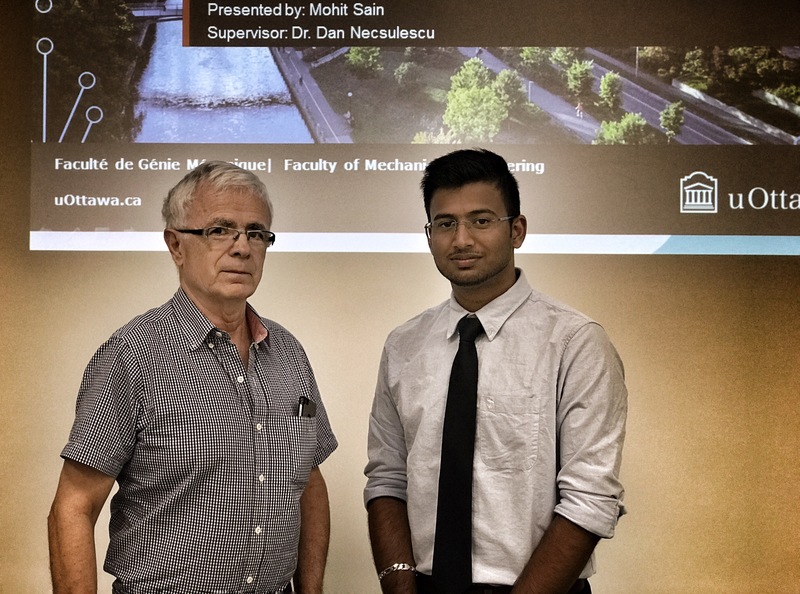 Mohit Sain, working under the supervision of Dr. Dan Necsulescu presented his MASc seminar yesterday. 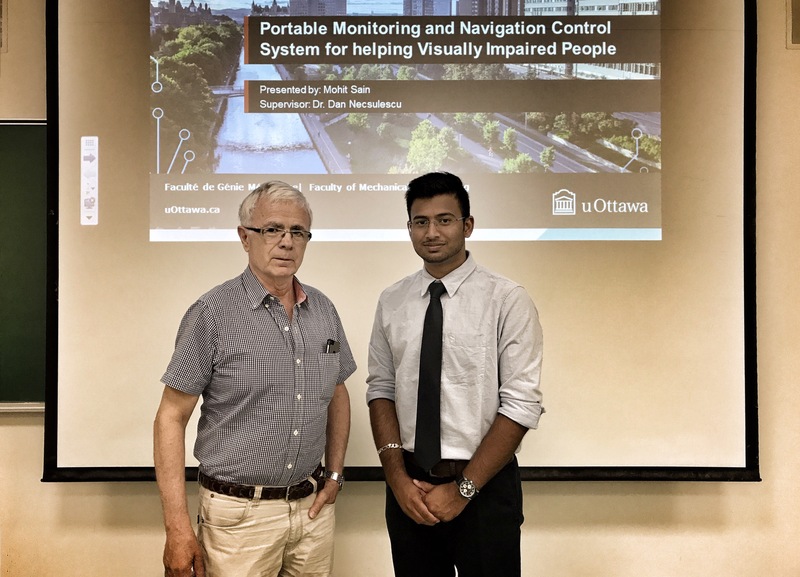 The title of his talk was “portable monitoring and navigation control system for helping visually impaired people”. 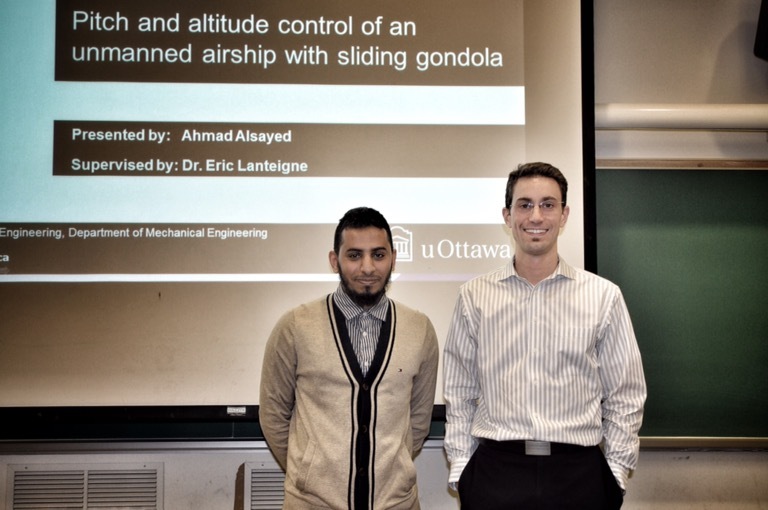 It was a very interesting talk! 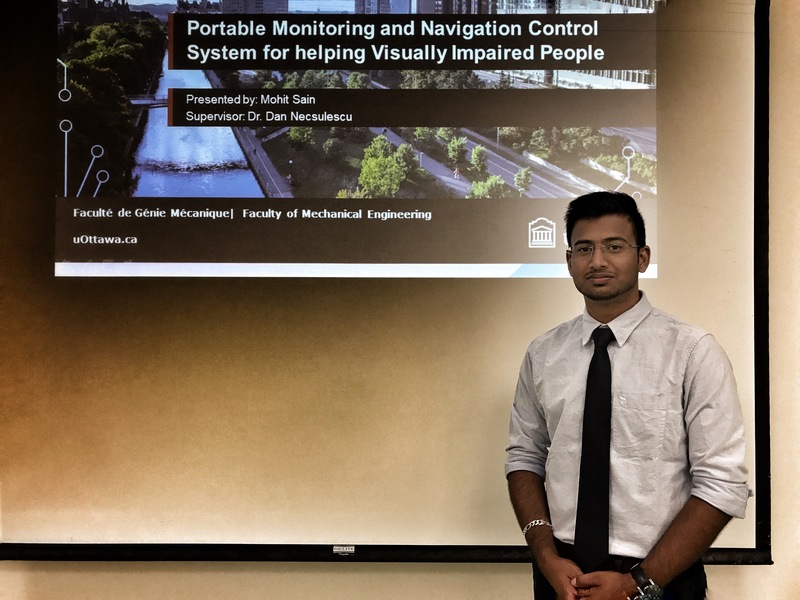 Congrats, Mohit! 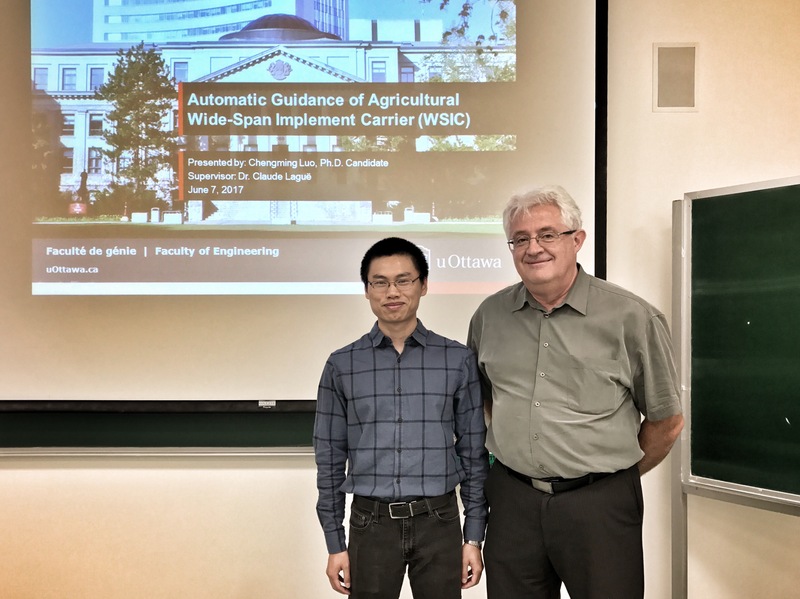 PhD candidate Chengming Luo presented his thesis seminar titled “Automatic Guidance of Agricultural Wide-Span Implement Carrier” last Tuesday. 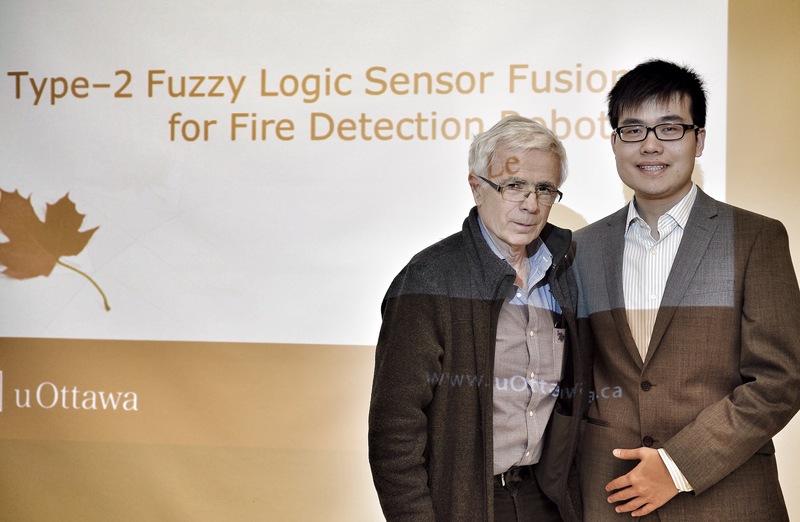 Chengming worked under the supervision of our very own former Dean, Dr. Claude Laguë. 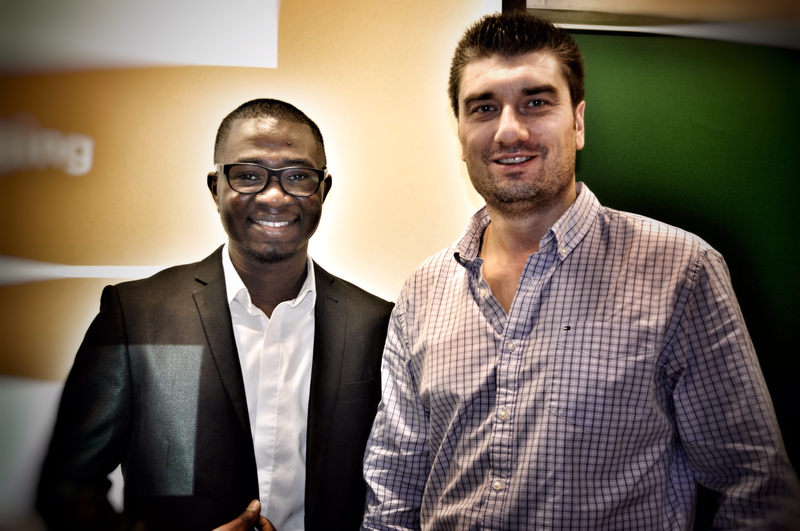 Dr. Laguë was present for the seminar and I got the chance to take a photo of student with supervisor. 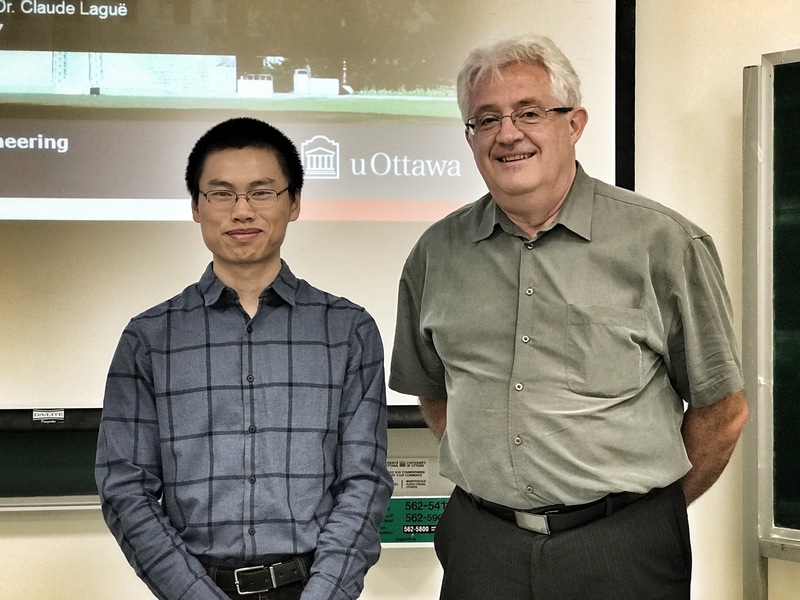 Thanks for an interesting talk and congratulations to Chengming for getting close to finishing his PhD! 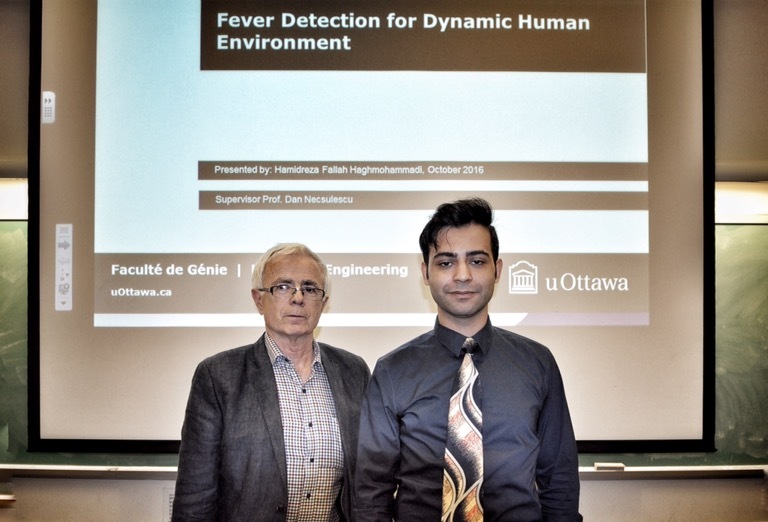 Everyone is cordially invited to hear Arian Panah present a talk on his MASc work: “Nonuniform Coverage with Time-Varying Risk Density Function”. The abstract of the talk is attached. The talk will start promptly at 2:30pm. Multi-agent systems are extensively used in several civilian and military applications, such as surveillance, space exploration, cooperative classification, and search and rescue, to name a few. 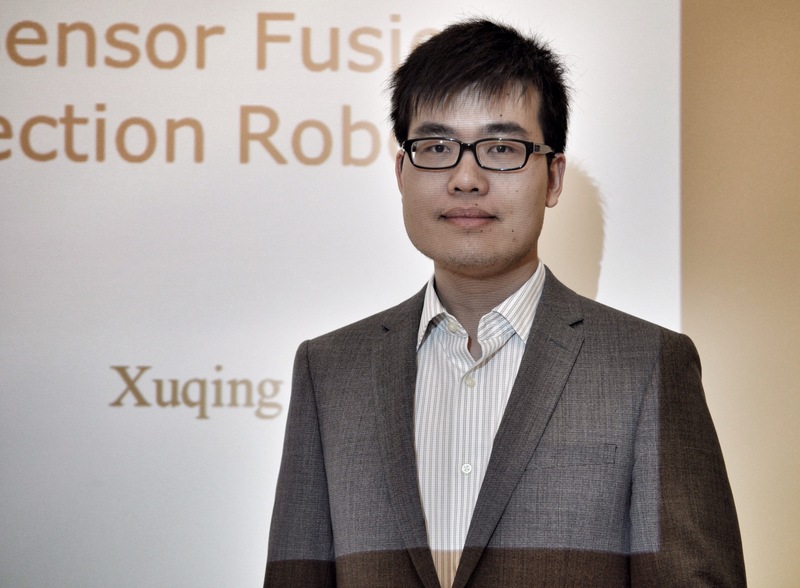 An important class of applications involves the optimal spatial distribution of a group of mobile robots on a given area, where the optimality refers to the assignment of subregions to the robots, in such a way that a suitable coverage metric is maximized. Typically the coverage metric encodes a risk distribution defined on the area, and a measure of the performance of individual robots with respect to points inside the region of interest. The risk density can be used to assign spatial distributions of risk in the region, as for example typically happens in surveillance applications in which high value units have to be protected against external threats coming into a given area surrounding them. The solution of the optimal control problem in which the metric is autonomous (a function of time only through the state of the robots) is well known in the literature, with the optimal location of the robots given by the centroids of the Voronoi regions forming a Voronoi tessellation of the area. In other words, when the set of mobile robots configure themselves as the centroids of the Voronoi tessellation dictated by the coverage metric, the coverage itself is maximized. In this work we advance on this result by considering a generalized area control problem in which the coverage metric is non-autonomous, that is the coverage metric is time varying independently of the states of the robots. This generalization is motivated by the study of coverage control problems in which the coordinated motion of a set of mobile robots accounts for the kinematics of objects penetrating from the outside. Asymptotic convergence and optimality of the non-autonmous system are studied by means of Barbalat’s Lemma, and connections with the kinematics of the moving intruders is established. 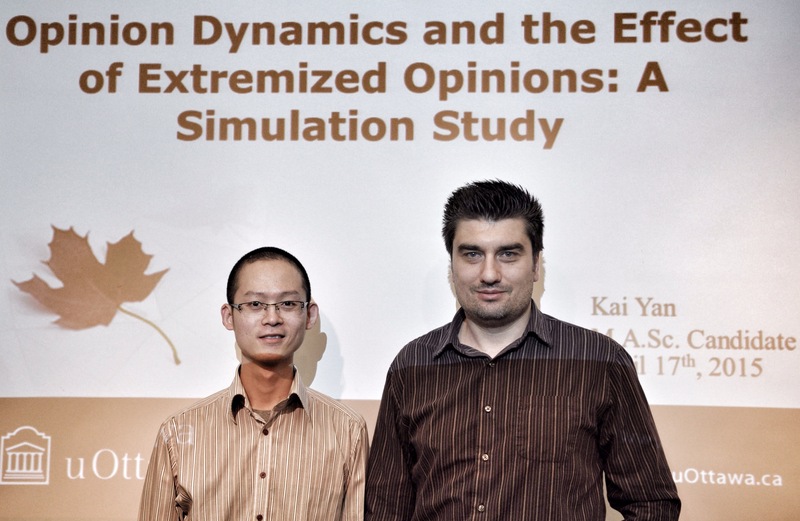 Several numerical simulation results are used to illustrate theoretical predictions.